The hot button topic will be on the agenda, and will likely dominate the discussions, at the NHL general managers meeting. Add Doug Weight to the ever-growing list of those seeking some semblance of clarity on what is and what is not goalie interference. The hot button topic will be on the agenda, and will likely dominate the discussions, at the NHL general managers meeting Monday through Wednesday at Boca Raton, Florida. 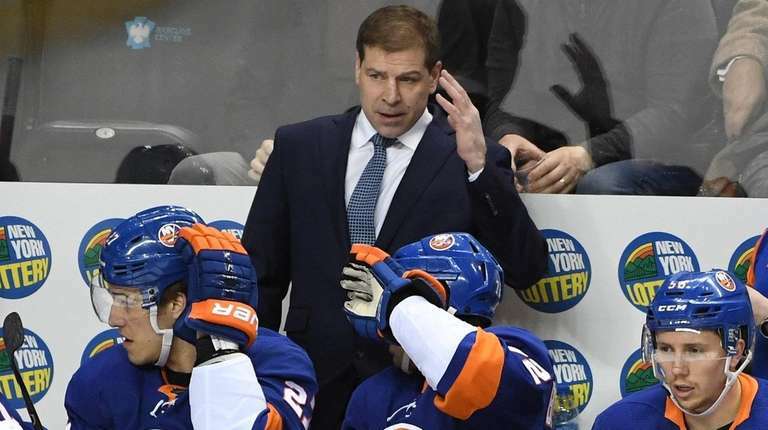 The Islanders coach was still red hot after Friday night’s 6-3 loss at Washington where he lost his challenge on Alex Chiasson’s power-play goal that made it 4-1 at 1:46 of the third period. Before Chiasson knocked in a loose puck in the crease, Jakub Vrana skated across the top of the blue arc and made contact with goalie Jaroslav Halak, who seemed to get spun out of position. To Weight, the play was very, very similar to the apparent goal Penguins defenseman Brian Dumoulin had overturned as he was called for goalie interference in a 5-2 loss at Toronto this past Saturday. Dumoulin did make contact with Maple Leafs goalie Frederik Andersen but after being pushed by Toronto defenseman Ron Hainsey. Sullivan could not challenge the play because Dumoulin was penalized. So instead of the Penguins cutting their deficit to 3-1, the Maple Leafs scored on the ensuing power play to make it 4-0. “Does that not look exactly like the Dumoulin goal?” a frustrated Weight said as he brought up Chiasson’s goal unprompted during his post-game media scrum on Friday. The issue is, has been and will likely continue to be, goalie interference is a completely subjective call. “I feel like it’s a good goal but I don’t know what is and what isn’t,” said Weight of Dumoulin’s goal, but he challenged the Chiasson goal based on the ruling about Dumoulin. Referees Francois St. Laurent and Dan O’Rourke immediately discussed the play with Weight. Not that it clarified anything for Weight. Now, the question becomes what changes, if any, will come about when the general managers talk about the topic this week. And if any changes are made, will they be made for this postseason? Many around the league would like that, though it seems highly unlikely that would happen. It could be that instead of the on-ice officials making the ruling upon video review, off-ice officials at the NHL war room in Toronto are put in charge. But what’s needed most is a clear-cut definition of what constitutes goalie interference, likely entailing a rewriting or clarification of the rule book. This much is sure: It will be very difficult to accomplish. Weight, though, is certainly rooting for more clarity. Being interviewed by MSG analyst Stan Fischler often takes a bit of concentration on the player’s behalf. “It’s funny, he doesn’t always ask questions. He makes a statement,” Hickey said of Fischler, 86, retiring from Islanders’ broadcasts following this season after working MSG Networks since 1975 and having seen his first hockey game in 1939. The Islanders’ season may be crumbling — actually, it has and is now just limping to its conclusion — but new dad Casey Cizikas’ mood couldn’t be better. Jack William Cizikas’ birth was induced just before the Islanders departed for a 10-day trip that took them to Pittsburgh, Vancouver, Edmonton and Calgary, returning to Long Island on Monday.